I have little use for a browser's history feature. I usually bookmark all pages that I consider important and work my way through the rest so that there is almost no need to go back to a previously visited page in a future session. Part of my discomfort comes from the Firefox history layout and functionality, which to be frank is not that great to work with. Mozilla recently published a new Mozilla Labs add-on called Recall Monkey (what's with all those silly names?) that improves Firefox's History by a lot. 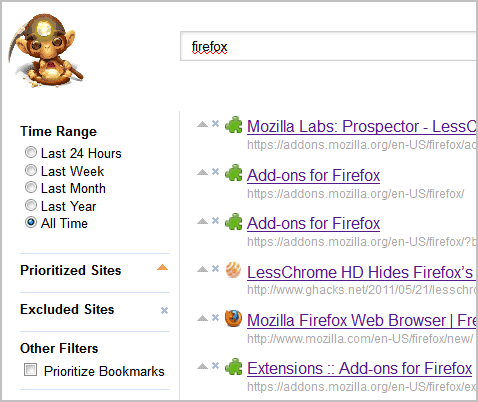 The add-on taps into Firefox's history database to provide the user with better search options. The restartless add-on places a single icon into the Firefox status bar. A click on that icon launches the search interface in a new tab. It consists of a search bar at top that powers the auto-updating search results. If you enter Firefox for instance you get all Firefox related history items on one page. The real strength of the program comes from the preferences and options on the left. Here it is possible to change the time range from all time to last 24 hours, week, month or year for instance. This can reduce the number of results greatly. Sites can be prioritized or excluded from the results. Say you want to find a specific add-on that you know is hosted on the Mozilla website. You could prioritize the Mozilla domain to give it some extra weight in the search results. This pushes Mozilla based results to the top of the list. Excluding sites on the other hand filters history items from domains from the results automatically. The last available option is to prioritize bookmarks, which can be very handy for users like me who use bookmarks extensively. The one thing that I'm not really happy with is that Recall Monkey forgets about the prioritized and excluded sites when you close the history window. An option to remember those settings (per search or globally) would be really handy. Another handy option would be to add filters to distinguish between local and remote files. Mozilla Labs's Recall Monkey is available for direct installation over at the Mozilla Firefox website. The add-on is compatible with all versions of Firefox from version 4 on. Update: The add-on is not compatible with recent versions of Firefox. It has last been updated in mid 2012 and appears to have been abandoned. There is no comparable add-on available at the time of the update. I agree with you that the history function has little practical use except the occasional search for a past page that was useful but not bookmarked. What I would really love is a history/statistics add-on that tells me how much time did I spend on a certain domain, maybe even make some charts on which pages have been visited more in the past than now etc. I’m the main developer for this addon. The thought behind the UI was to let you use one tab, search for something, and when you’re done close it, for example what was that article about “camera focus startup mountain view”, or queries from memory like that, so the prioritized and excluded sites would change session to session. Can you please tell me a use case where you would want to preserve settings. A basic example would be if a user does not want specific sites to appear in the results listing, for instance no search engines, a forum or social networking sites. On the other hand, users who often run the same history search might want to have options to include sites in those searches. But that would require an option to save previous searches and link included and excluded domains to those then. I’m looking for a specific site that I’ve lost but I know it’s somewhere in my history. I have a lot of history so I need to be able to store the preferences for that specific search and my progress in it to be able to pick up the next time I have time.